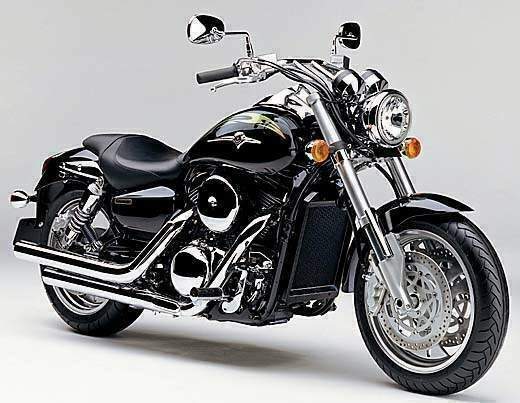 The Vulcan 1600 Mean Streak’s 1,552cc V-twin engine packs a punch with features such as liquid cooling, electronic fuel injection, dual spark plug digital ignition and four valves per cylinder. It also features hydraulic valve lash adjusters to reduce maintenance and a gear-driven counter balancer to keep everything running smoothly. The Mean Streak’s chassis provides the rider with nimble handling and high-speed stability unmatched by the competition. Sportbike-style 43mm inverted forks and a reinforced swingarm with dual air-assisted hydraulic shocks soak up bumps and other irregularities in the road. Stopping power is provided by dual radial mount front disc brakes with grippy six-piston calipers and a single rear disc brake. 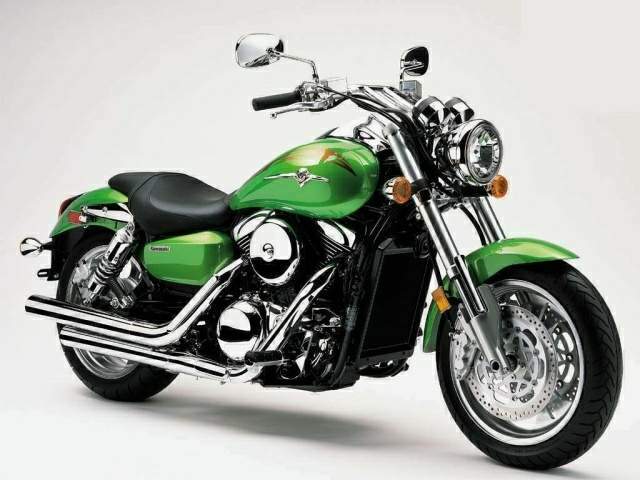 In the cruiser world, appearances and rider comfort are every bit as important as massive power, so Kawasaki polished the valve covers and cooling fins for a bright, high-performance image. 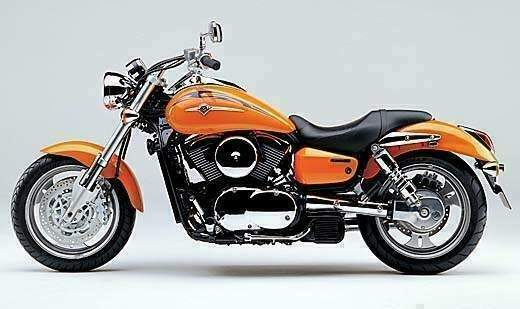 The 1600 Mean Streak’s bright 17-inch aluminum wheels enhance the bike’s high-class image, while high-performance radial tires provide exceptional grip and stability. Rumbling across the middle of Florida with the speedometer reading 80mph, the tachometer registering 3750rpm and the throttle barely off the stop, I set my sights on home. With another hundred miles to go, close to a full tank of gas, and one of the most comfortable seats I have sat on in a while, there would be no need to stop. I was riding Kawasaki's new 'Mean Streak' and had been running hard since Daytona. The big 1500c fuel injected V-twin was purring away beneath me, and the air suspension was soaking up the bumps while keeping me firmly planted in the saddle. A week or so before Biketoberfest I got an invite to attend a Kawasaki press day with the use of a Mean Streak for a few days after. Well, I might not be the sharpest tool in the shed, but it did not take me more than a split second to figure this one out. I would head over to Daytona for a media meeting with Steve Rice and John Hoover of Kawasaki, ride to lunch through the picturesque Ocala National Forest, and then go have fun on the bike for the next three days. Arriving in Daytona around 9.30 am, I quickly found the Kawasaki demo area located on International Speedway Blvd and introduced myself to Steve Rice. We went over to the Kawasaki hospitality area for coffee and a chat while we waited for the other journalists to show up. As we were getting acquainted, Steve gave me a little background on the Mean Streak and some of the other new Kawasaki models out this year. With the arrival of Bill Andrews from the AMA and Joe Talarico from City Cycle Magazine, we were introduced to John Hoover to learn more of the technical aspects of Kawasaki's newest Vulcan. John and Steve have played a big part in the Mean Streak's development, and enthusiastically told their story as we sat enjoying the early morning breeze. 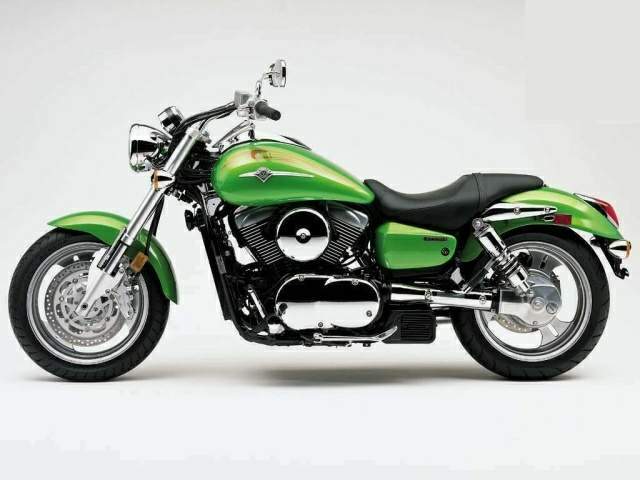 Kawasaki Vulcan's have been with us since 1985. During that time the big Vulcan cruisers have undergone a slow evolution culminating in the motorcycle you see here today; a perfect blend of power, comfort, handling and braking. Kawasaki did a lot of research before building the Mean Streak. They hit the streets and really took the time to ask people what they wanted in a cruiser. They leaned heavily on the Vulcan Riders Owners Club (VROC) for leads, and even went as far as inviting certain members of the club to come along and evaluate the pre-production machine. With more than a couple of lifetimes motorcycle experience between them, Steve Rice and John Hoover were able to communicate all of this to the factory, and help produce the machine you see here today. A lot of time was spent figuring out how much power the newest Vulcan should have. With the majority of cruiser riders not looking for huge amounts of horsepower, Steve and John kept the power to a more than adequate 65 at the rear wheel. They built different engines with varying amounts of power, including a turbo that made in excess of 168 horsepower. While it was never intended for production, it proved to all involved that if the engine could handle that much horsepower, the production engine was going to be bullet proof. A normally aspirated motor was made to produce just over 100 bhp, but in tests it just proved too much for everyone. In answer to a question about the horsepower situation John Hoover told us, "Can we go further? Yes." "Will we go further? Maybe." We then learned that Kawasaki had looked to the automotive world to help with styling clues for the Mean Streak. With a desire for a "neo-retro" styled machine, cars like the Chrysler PT Cruiser and the Dodge Prowler went under scrutiny. Market research had revealed that a lot of riders are looking for a factory custom, and the Mean Streak is here to accommodate them. And what an awesome job they did. 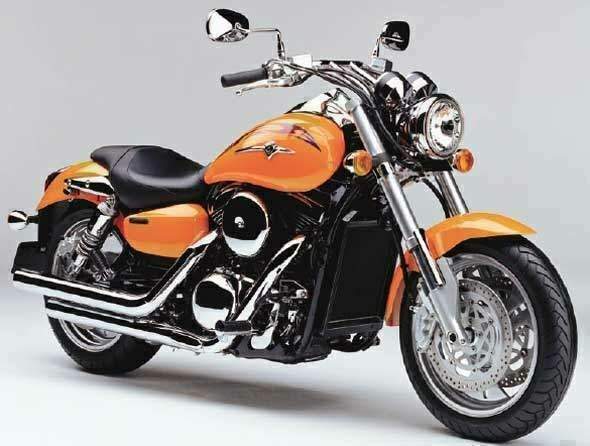 With the seamless 4.5-gallon fuel tank, fenders and side panels painted in stunning candy gold spark paint, the Kawasaki turned heads and provoked comments wherever I rode. The chrome consul on top of the tank contains the fuel cap and instrumentation lights, and the neatly sized electronic speedometer and tachometer sit between the custom chromed drag handlebars. Briefing over, it was time to go and ride the beast. Steve and Chip Ellis (Kawasaki Funny bike drag racer) accompanied us on ride out into the Ocala National Forest. Lasting long enough to give us a great taste of the bike, we ended up at cool Florida style restaurant for lunch. We hit some deserted roads with Steve making sure we put the Mean Streak's high speed handling to the test. Snaking through the thick forest with triple digit speeds registering on the speedometer, we cranked the bikes through numerous sets of fast sweepers. Rock solid, and totally predictable, the big Vulcan stayed firmly on line, with the suspension soaking up any irregularities the pavement threw at us. The riding position remains comfortable, even at high speed, and when it comes time to slow things down Kawasaki have provided a first class braking system. Using two six-piston calipers and dual 293mm rotors, straight from their ZX-9, you will be very happy with the performance afforded by this sport bike set up. Add to this, modern 17-inch cast-aluminum wheels, using a beefy 170/60-R17 radial out back and a 130/70-R17 radial out front, and the sport bike theme continues. The last and most visually impressive piece of sporting hardware to grace the Mean Streak is the sturdy looking inverted cartridge fork, designed especially for this bike. Lunch over, I rode a while with the group before heading south and west for home. This was my opportunity to put a quick 350 miles on the bike before tomorrow lunch time when I needed to be back in Daytona. The weather was kind and traffic fairly clear for the duration of my ride. The following morning I saddled up, and hooking up with my riding buddy Eric Bock we set off to travel across Florida on some quieter back roads. Firstly, we ran north on the Interstate 75, settling in amongst the traffic at around 80mph, which seemed to suit the big twin. Upgraded from the previous generation Vulcan, the fuel-injected motor is an absolute gem. It is just so smooth from any where in the rev range and pulls like a train. It makes no difference if you twist the throttle at 40mph or 80mph in top gear; you are instantly rewarded with smooth, powerful acceleration. Kawasaki claims a 10 percent increase in power but seat of the pants impressions would say more. Fuel is injected into the cylinders by dual 40mm throttle bodies, while the larger intake and exhaust valves are opened and closed by all new camshafts. This allows the new engine to rev higher and produce the extra power. Turning west we meandered across the state passing through old historic towns and rural areas devoted to livestock and crop farming. We saw plenty of motorcycles, bound for Daytona, and enjoyed a relaxing few hours in the saddle. The Mean Streak makes the perfect tool for the rolling terrain, pulling easily up the small hills and handling the twisty parts with ease. Clicking up and down through the newly revised gearbox I had trouble remembering easier shifting on anything I have ridden lately. Passing through the historic town of Deland, I noticed admiring glances from some of the many bikers congregating at the gas stations along the route. Entering Daytona, traffic slowed to a crawl giving the big Vulcan another opportunity to show its versatility. The tractable motor, and light handling capabilities, made piloting the Mean Streak through the stop/start traffic a breeze. With no surging or hesitating from the fuel injection, I was able to roll along at walking pace in second gear and accelerate through gaps in the traffic with ease. With traffic backed up over the bridge to Main Street, we parked up and walked around Beach Street and on down to Main. We watched the circus for a few hours before hitting the saddle en route for our accommodation in Deland. Leaving Daytona in the warm early evening air I hit my nirvana with the Mean Streak. With most of the other bikes involved in a frantic struggle to race each other to the next red light, I just cruised along in fourth gear, the tachometer registering a little over 2,000 rpm. Relaxed and comfortable I leaned back and enjoyed the finest front row seat at the show.